At just $549, the Optoma HD143X stands out as one of the less expensive of the eight projectors in our group review. And at that price it is an excellent value for its combination of contrast, three-dimensionality, minimal input lag for gaming, and solid 3D performance. In addition, like many Optoma projectors, it also has the advantage of showing virtually no rainbow artifacts. As you might expect from its slightly lower than typical lumen rating, the HD143X delivers a bit lower brightness than its competition with our video optimized settings as well. But the brightness is not enough lower to make a significant difference in acceptable image size for any given light level. Using the video optimized settings and a 1.3-gain screen, it is bright enough for a 145" 16:9 image in a dark room or a 90" image with moderate ambient light. Low Lamp Mode. Eco mode is 63% as bright as Bright mode. Video Optimized Lumens. For film and video, the easily tweaked Cinema mode offers neutral color with no loss of brightness. Image quality is also near the top of the sub-$700 pack for contrast and sense of depth, although a small step below the best. At 758 ANSI lumens, Cinema mode will light up a 145" diagonal 1.3 gain screen in a dark room. If you want to run with moderate ambient light in the room, we'd suggest keeping the screen size to 90". Video Performance. Even without adjusting color control settings the Cinema and Reference modes deliver natural-looking color along with good contrast and sense of depth. If you need higher brightness, Bright mode is largely usable, with only a minor green bias in most scenes. However the green bias as well as some posterization becomes more noticeable in the flesh tones on facial close ups. Much the same is true for Vivid, but neither the posterization nor green bias is as extreme. The Game mode is the brightest mode that delivers consistently realistic color. It doesn't offer the image three-dimensionality and contrast of Cinema mode, but the picture quality is good enough for casual daytime use when you need the extra brightness to compensate for ambient light. Zoom Lens Effect on Brightness. With only a 1.1x zoom, there is no curtailing of light at the telephoto end of the lens. Brightness Uniformity. The measured 38% brightness uniformity for the HD143X is unusually low and enough to see easily with static images like a Windows desktop or a word processing document. The saving grace for video and film--and what keeps this from being distracting--is that the human eye tends to accept variations in brightness in photorealistic scenes as being part of the original image. Input Lag. With Enhanced Gaming set to On, input lag measures a very quick 16.4 to 17.3 ms, depending on the Brilliant Color setting. With Enhanced Gaming Off, the lag measures a still fast 33 to 34 ms.
On-board audio. The 10-watt mono speaker delivers high enough volume for a small family room and distortion free sound quality even at top volume. If you want bigger sound, the stereo audio output will drive a sound bar or other external sound system. Fan noise. 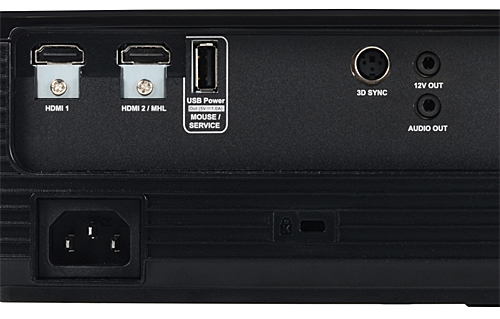 The HD143X's fan noise is typical in our group of eight sub-$700 1080p projectors. Bright mode is loud enough to notice in quiet moments in a family room. Eco mode is quiet enough so few would notice it in a family room with ambient noise, but might notice it in a quiet room. The sound quality in both is an unobtrusive steady white noise. High altitude mode is also typical: loud enough in both Bright and Eco modes to be potentially intrusive in quiet moments, even in a family room with ambient noise. All connectors are on the back panel. Throw distance. The throw distance for a 120" 16:9 diagonal image with the 1.1x zoom lens ranges from about 12.8 to 14.1 feet. The Optoma HD143X Projection Calculator will let you find the throw distance required for the screen size you want. Lens offset. The HD143X's lens offset is designed for either mounting upside down in a ceiling mount or placement on a low table or bookshelf behind the seating area. A high shelf is best avoided because the entire image would be above the center line of the lens. Setup would require tilting the projector down and then squaring it up with keystone adjustment. This is something we try to avoid with 1080p projectors as it requires compression of 1080p video signals, reduces lumen output to some degree, and can create artifacts in fine detailed patterns in an image. With the projector on a table, the bottom of the image is about 14% of the image height above the center line of the lens. 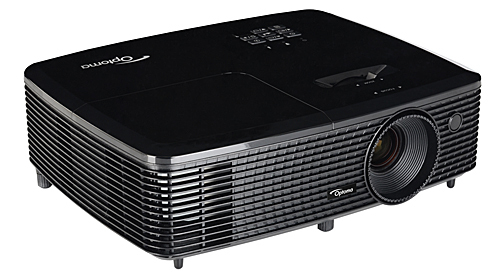 The Optoma HD143X offers more than enough to qualify as a solid value for $549. It delivers good image quality for the price, it displays 3D well, and it is bright enough for a 145" 16:9 image in a dark room or a 90" image with typical night-time levels of ambient light in a family room. If you are into serious gaming, the HD143X's very quick 16.4 ms input lag makes it a good choice for games where reaction time matters, although it would be even better for gaming if its onboard audio offered a higher volume. With its video optimized settings for 2D, the HD143X offers suitably neutral color, good contrast, and a good sense of depth. It also shows rainbow artifacts so rarely that even those who see them easily may not notice any, much less find them annoying. For 3D, it supports both DLP-Link and VESA RF glasses; its 3D mode shows only the typical drop in brightness compared to its 2D modes; and unlike many projectors, it will let you customize the 3D mode settings. The 38% brightness uniformity is surprisingly low. However, the eye tends to interpret brightness variations in movies as part of the original image and adapts to any variations it notices quickly. On the plus side, the lens delivers crisp, edge-to-edge focus. On both our horizontal and vertical test images, with alternating one-pixel wide light and dark lines, it held the lines across the entire screen from top to bottom and left to right. Images with repeating patterns were also equally crisp over the entire screen. The Optoma HD143X isn't quite as bright as its most direct competition, but the difference isn't much. In exchange, it costs less than most, it delivers natural-looking color along with good contrast and depth for the price, it offers a fast lag time, and it handles 3D better than most. This combination lets it do a pretty good job for games or as a TV substitute. However the audio volume is lower than competing models as is the brightness of the video optimized picture. These two factors keep it from being a top pick for either gaming or TV substitute. BUT...if you already have an external sound system and won't be relying on the projector's audio, the HD143X would be an outstanding choice for video gaming. After seeing all of these eight projectors side by side, by comparison the Optoma HD143X handles 3D well, and for 2D it scores among the best in this roundup for color, contrast, focus, and three-dimensionality. All of that considered together, along with its aggressive price, is enough to outweigh its low brightness uniformity and easily make the Optoma HD143X one our top picks in the sub-$700 category for classic home theater in a dark room and for 3D. I am really sorry but this is like a joke. how can you say 38 percent brightness uniformity as a small thing. there is simply no uniformity at all. it is a faulty projector and if the company is allowing that in their product lines it is more than a fault, it's unacceptable. you keep saying of human eyebcamt recognize that in a movie but trust me when I say this, my Benq has problem and it's always visible because one side of the screen no matter what it is brighter than the right side. it's in such harmony that brain can not not see any other way. So why not demand the company to fix the lens system.. Thank you so much guys for the website and your work. It's so awesome and informative! Glad I've found it, wish there were more dedicated pages like this one. Thanks for a great review! Have You tried the HD144X? Brighter but in other respects the same? I've had this projector for a few days, the rainbow effect is terrible, even my 10 year old son said "daddy, why can I see rainbows" picture quality is good. But it's terribly annoying when a white part of a dark screen looks that bad.